I have just finished my domestic duties...cleaning my work clothes in the bathroom sink (cheap chinese laundry is a myth!) and I thought I would share some thoughts on our first week of work in Changchun. The novelty of being here hasn't quite worn clean yet but routine has definitely settled in. After filling our bellies in the hotel restaurant all all 50 of us (artists) are loaded onto the bus and shipped down to the sculpture workshop to start work at around 8am. Our workshop is a building complex with 4 or 5 rooms for most of the artists to work in. The stone and wood carvers all work outside in the varying elements of each day. The room I share with 13 others, is a long hall drenched in natural light from a huge sky-light. Within minutes of the bus arriving the space is alive with the colourful movements of our interpreters greetings and workers standing poised for instruction and construction. The gentle sounds of the morning are smashed with enthusiastic vigour. Steel is cut, bent, beaten, shaped and welded. Crash, bang, clang, zackp, aaaahhh.....Heaven! As you might imagine with 13 artists all working hard in the space it gets very loud and very hot. When I look at my chinese assistant Chou, his round face is always sprinkled with little jewels of sweat and his shirt wringing wet. I can only imagine I look very similar too, but due to my Irish blood probably worse. Our work continues though to 11am then on to the bus to be delivered back to the hotel. After lunch there is time for some emails and a short snooze then it back on the bus again at 2pm for the afternoon's work. Crash, bang, clang, zackp, aaaahhh.... and its time to get back on the bus again for 6pm finish. This has been our routine for the last 8 or 9 days and it must be followed exactly or there will be trouble! This sounds very familiar, the routines that are machine-like. Sunday in China is a regular day. the banks and government offices are open for regular business. I had my laundry done by the hotel on the first day, but soon found out that it was no affordable. So most of us did our laundry in the bathroom sink. Leaving the window open and no air conditioning, the clothes would dry by the time I returned in the afternoon. The blow dryer also helps for quick dry socks and shoes. I never took naps in the hotel and did not go there for lunch. The commute to me was a waste of time. I would some times eat with the students under the shade of the Gourd vines. I used the lunch time to walk with the interpreters or alone through the park and visit the sculptures under varying light conditions. 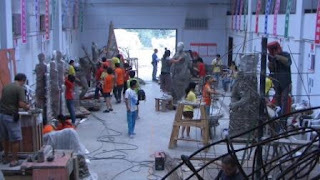 There will be pressure to finish quickly because the fiberglass casting crew will soon arrive. 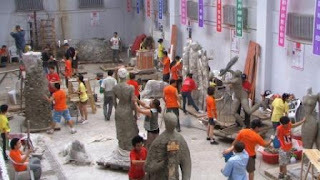 This blog captures my art and pottery adventures in China and beyond. Sign up and be the first to hear about new pots and sculpture, cool ART events and dates for CREATIVE WORKSHOPS. The Hinaki sculpture represents the traditional stories, passed down from generation to generation, of the New Zealand native eel. The form of this eel sculpture is based on the shape of Maori traditional eel nets which are called 'hinaki'. This work is a homage to the ecology of the rivers and waters of our world which are under constant threat from urban development and human pollution. The natural world of our land and our rivers are of huge cultural and historical significance to the people of Aotearoa/New Zealand. Eels are inconic creatures that have been woven into countless stories over the centuries, stories told by both young and old alike. The hope is that this sculpture will visually communicate those stories in a way that increases understanding of NZ culture and inspires people across cultures to work together to protect and preserve our natural world. I'm going back to China!